Hi friends.. Today am back with a sweet, spicy, crunchy, flavorful and super quick rice recipes. 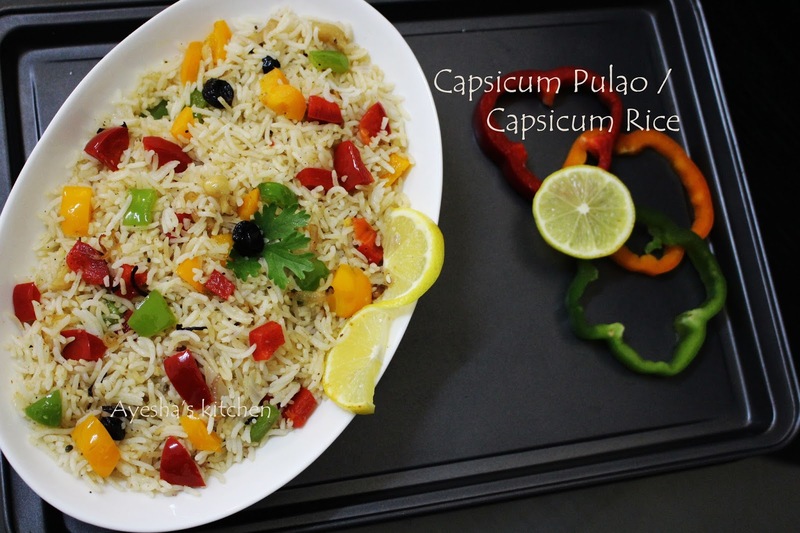 Its the Capsicum rice recipe / Pulao, the most simplest and delicious Indian rice recipe. Like Chinese food dishes , this rice meal too has its unique flavor, attractive texture, sweet and sour taste. Moreover it is kids favorite easy healthy one pot meals and it makes a perfect lunch box meal for them. 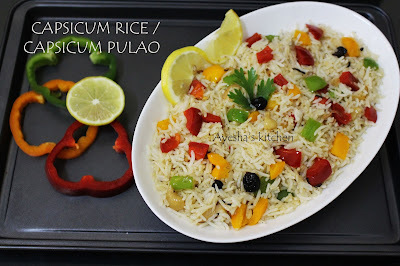 Today, am sharing the most simplest pulao recipe. It is spicy, sweet and crunchy. Capsicum rice / capsicum pulav / capsicum masala rice. This capsicum rice pulao can be made in minutes and goes good in lunch box for kids as it is colorful and kids friendly. I love capsicum rice and often prepared for lunch or dinner when i have some left over rice. As this dish is very flavorful and delicious, we does not need any side dish other than raita or pickle. An easy quick and delightful one pot meal which i often prefer to cook . You can add more veggies like corn, carrot along with bell pepper for a healthy complete one pot meal. Here i made this capsicum rice pulav with the left over ghee rice only. But am sharing the complete recipe including the rice preparation. 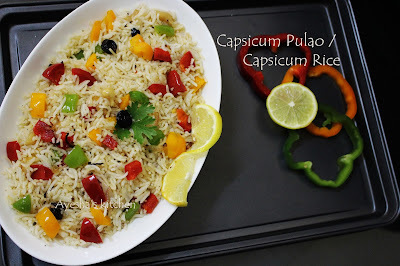 So lets learn how to make capsicum rice pulao recipe / rice recipes for kids /one pot vegetarian healthy meals . Do try. It is best to prepare such rice dishes with left over cooked rice. I always take more amount of rice whenever i prepare ghee rice and keep the leftover cooked rice in refrigerator /fridge for my kids and hubbys tiffin meals like fried rice, jeera rice, lemon rice, mushroom rice, mushroom pulav and so on. Now heat a nonstick wok with some oil and when hot, sizzle cumin seed. Then toss cinnamon, cardamom, star anise, cloves well and then saute onion until transparent. When done, add green chilly, ginger garlic paste and cook until the raw smell goes off. Then add required salt. Now add the chopped capsicum, coriander leaves and cook for few minutes. Do not over cook the capsicum. Do not add more salt as we have salt in cooked rice. Then simmer the flame and add lemon juice and give a fine mix. Now add the rice to the sauteed mixture little by little and gently mix well. Cook for 2 minutes on a low flame. Garnish with roasted nuts and raisins. Serve hot with raita or pickle..